Voted 2nd in the 2016 Halifax Quality of Life Rankings! Stretching from the outskirts of London in the south to the Midlands in the north, Buckinghamshire offers the best of both worlds – rolling hills on your doorstep with the capital, Birmingham and Oxford, just a short ride away. An area of outstanding natural beauty, it has been ranked as one of the top rural areas to live in the UK. 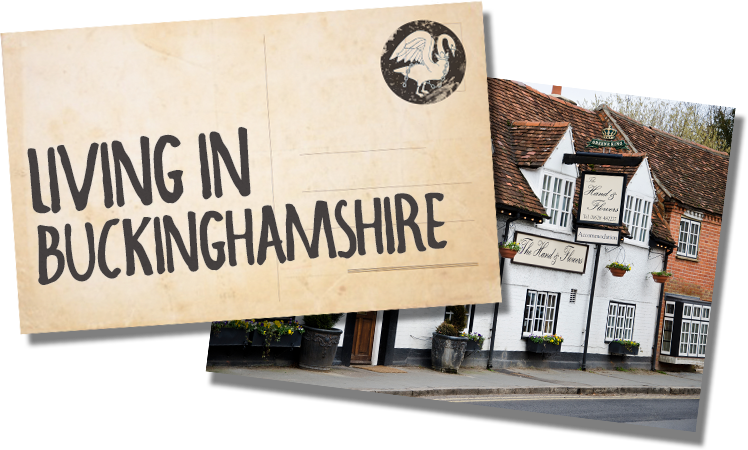 From the buzz of Aylesbury, High Wycombe and Milton Keynes to the smaller market towns including Buckingham, Amersham and Winslow, and characterful villages such as Waddesdon and Brill, there are locations to suit a range of lifestyles and budgets. Buckinghamshire has the most National Trust properties in England, is the birthplace of the Paralympic movement and is home to Pinewood Studios – the studios behind blockbusters including James Bond, Star Wars and Harry Potter. Buckinghamshire is really well connected to London and the Midlands. By road… Lying just outside the M25, access to London, the Midlands and airports is very easy via the M40, M4 and M25. The A41 from Aylesbury is quick (25 minutes) to the M25, then onto central London (in around an hour). By train… Central London is just over 30 minutes away by train from High Wycombe and around an hour away from Aylesbury. You can hop onto the London Underground in the south of the county with the Metropolitan line starting in Amersham. Your Travelchoice card will save you a third off rail travel when travelling with Chiltern Railways and 50% on bus travel around the county. Nearest airports… We are close to both Luton and Heathrow airport, convenient for family holidays or weekend European city breaks! Schools in Buckinghamshire offer high quality education, preparing pupils for adult life. They are amongst the best schools in the country, consistently performing above the national average. Buckinghamshire is one of the few counties in England to offer grammar school education alongside upper/all ability schools. The Transfer Test (formerly 11+) decides which type of school will best meet a child’s needs. In addition, Buckinghamshire is well-served by many independent schools for children from the ages of five to 18. BCC employees get discounted childcare places at a number of nearby nurseries. You can also save money on childcare costs by opting for the Childcare Voucher Scheme. From the Harry Potter Studio Tour to Bicester Village, there are lots of great attractions nearby.